← I’m Back — hopefully — maybe? 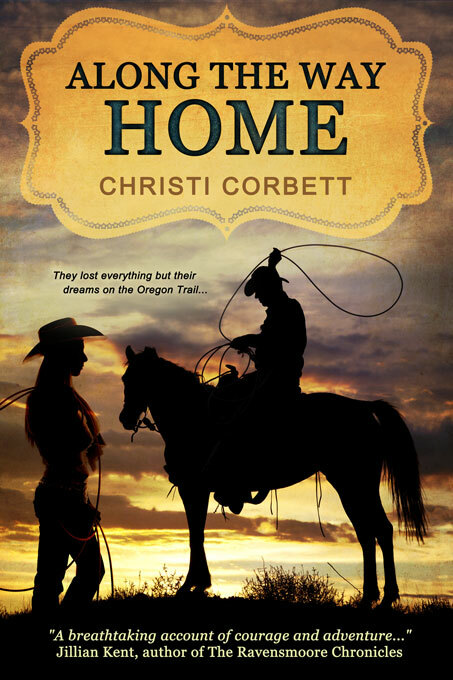 I want to take this opportunity to introduce Christi Corbett’s new book ALONG THE WAY HOME. Christi is one of my writing pals and part of our local writing group. I’ve had the privilege of reading many chapters of Along the Way Home and providing hopefully useful critiques and advice. I’m so excited that I now have the opportunity to read the whole book. Christi has worked hard getting the characters and settings just right, making sure the historical facts are accurate and making the story a “keep the pages turning” read. Congratulations, Christie! It took me thirteen years to drag my debut novel over the publication finish line. There were times when I honestly didn’t think I’d make it, but what kept me going were the writing friendships I’d developed along the way. How about you? How do you support the dreams of your friends and family? Kate Davis is intrigued when her father reveals his dream of starting a horse ranch in OregonTerritory. Settlers out west value a strong woman, and though she manages the financials of her father’s mercantile her competence earns her ridicule, not respect, from Virginia’s elite society. I’m addicted to coffee, sticky notes, and the Oxford Comma. I live in a small town in Oregon with my husband and our twins. Our home’s location is especially inspiring because the view from the back door is a hill travelers looked upon years ago as they explored the OregonTerritory and beyond. Along the Way Home is a Sweet Historical Romance. It released in e-book format on June 11, 2013 and will be available in print July of 2013. It is available on Amazon, Barnes and Noble, Kobo, Astraea Press (my publisher) and several other retailers. This entry was posted in Uncategorized and tagged Along The Way, Astrea Press, Critique groups, Historical Novel, Historical Romance, Horse Ranch, Oregon, Oregon Trail, Pioneers, Strong Women. Bookmark the permalink. Thanks so much for sharing your blog and your readers with me today! So glad to share your book with others. I’m happy I’ve been able to have an insider’s look at the book and the process. Hi Tori, good to see you back – frantically busy just now but look forwared to reading your latest posts. Thanks, Rosalie, for the welcome back.